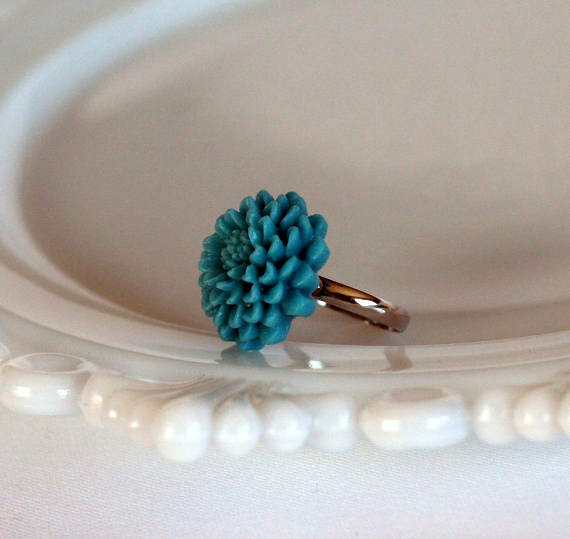 ashley of poppy chain boutique is back and bringing massive quantities of chic handmade jewelry as always. 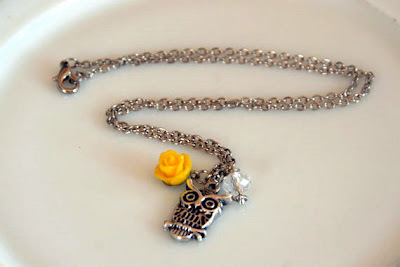 hello friendly little owl charm necklace. i shall call you hedwig and the dark lord shall never prevail over you as long as you are nestled near my heart. wine lotus earrings. 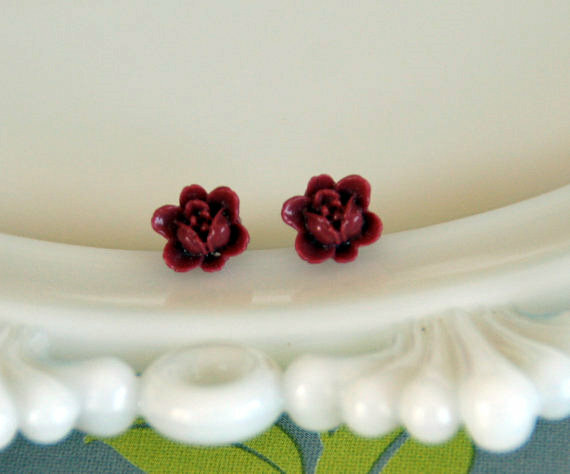 love the new flower shape of these guys, and hello gorgeous wine color! ashley is giving away a free pair of earrings of your choice! to enter: leave a comment here telling me your weirdest fear/revulsion (mine=wet paper). winner will be picked on thursday morning. I absolutely hate loose strands of wet hair that you can't get off of you!!! like when you run your fingers through your wet hair and come out with a few strands woven into your fingers-- it literally makes me want to gag. Oh, I'm a follower. I laugh at you daily. And with you. But mostly at you. Because you're funny. ALSO- I'm a follower. Duh. I really hate wet clothing sticking to my body. It grosses me out and I can't even move! My strangest fear is birds!! I can't stand them! Vultures. I have a reocurring dream about having my flesh ripped off by vultures. And of course I fear any stain on my carpet. The thought of a stain on my carpet makes me sweat! I reallllly hate wet hair. I can't stand to get dressed while my hair's still wet, and I just don't like touching it, in general. Great white sharks in the swimming pool, yes I am afraid of them and yes, I know that a shark could never survive in an chlorine pool, but I still fear them.I was so convinced that there was a shark in the pool that as a child I would never go in the pool alone I always made sure there was at least one other person (usually one of my sisters) in the pool with me, so they could get eaten/attacked first leaving me time to escape, I never thought it could happen the other way around as I was a child with a simple mind and large imagination. I didn't tell anyone about the shark in the pool until I was an adult because I knew they would laugh at me, and and they did. I cannot abide that sucking-in sound people make when, say, they're taking the last sip out of a pop can. Or sucking in air through their teeth. The sound affects me like nails on a blackboard - my body recoils and I get instant goosebumps (in a bad way). My husband has been well-trained to avoid making this sound at all costs. ...Well, you asked for weird, right? ...and, I follow your blog (duh). I'm afraid of maggots jumping out of over-ripe fruit when I slice it! It happened once with a mango, and the thought of it still terrifies me. I am repulsed by squeaky cotton between my teeth. Spiney chills just thinking about that. Can you picture putting a towel in your mouth and it squeaking between your teeth? Yeah, that's the feeling. I am repulsed by the sound of clicking teeth. Not like when people are eating, and their teeth happen to click together. No, I'm talking when people consciously force their jaws to click together. I can't even accurately describe it but the sound -- and watching it! -- makes me freak out in ways I can't describe. Oh, and I follow you!! And I tweeted this bad boy, too. My biggest pet peeve/repulsion is people who walk around barefoot in public. Thats how you get diseases people! I hope you wash your feet before you get in bed! I hate having sticky hands! gross. I am repulsed by the sound of someone gulping liquid - Urghhhhh! Err...I think I did that wrong. My weirdest repulsion/fear...ha. Maybe picking just ONE?! Cotton Balls! They just freak me out! EWE!